Physics is the foundation of science and technology, and is applied to many areas of our society. The Graduate program in physics provides the students with deeper and enhanced learning of the subject. 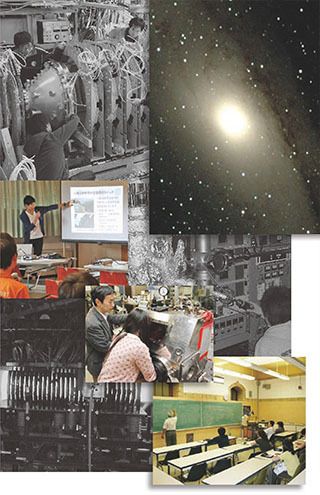 The Department of Physics of Nihon University was established in 1958. Professor Hideki Yukawa, the first Nobel Prize winner in Japan, served as an advisor. The department is committed to his vision of enabling the students to explore new frontiers in science. The Graduate program offers several research fields in physics, including theoretical and experimental plasma physics, basic nuclear fusion, astrophysics and cosmology (theory), theoretical and experimental condensed matter physics, basic and applied research on superconductivity, nonlinear physics and sciences, computational physics and sciences, theoretical nuclear and elementary particle physics, field theory and the many-body problem, and the history of science. Our graduate students are of very high research caliber and their works are published in major international journals. Graduates of the program find employment as engineers, system-engineers and researchers (computer science and material science) in electrical and industrial companies. In addition, our graduates enter professions such as university professors, high school teachers and government officers.